patch andi: One job down. Many more to go! Today, I worked on the MAMMOTH task of tidying up my sewing/work space. Even though I would love it to be prettier with white furniture and matching everything, its pretty great to have ANY space for such indulgences. It feels great to be able to see the floor again. I plan to finish it off this week at Perle 8s. Once it's finished, I'll tell you what it is. My WIP pile is slowly diminishing. Hooray!! Have a great week of stitching and living life. Great quilt, wish I was coming this week to see it. Will be there next week, though, will hopefully still be doing my quilt with the hand quiliting (though i'll be happy if it's done, too!). I'm not liking the knots on the back, but I guess you just get used to that? 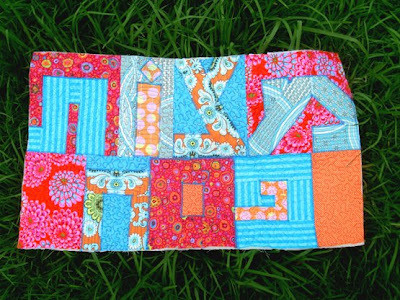 Have a new quilt in mind for my little one too. See you soon! Doesn't it feel great to have a clean space to work in! I am so intrigued by that quilt. I can't wait to see more of it! oh I long for a custom-built working space - with lots of shelves, drawers, big bench space and coordinating boxes made from my favourite fabrics but for now I make do - so long as I'm sewing I'm happy! I love the quilt behind the hat! 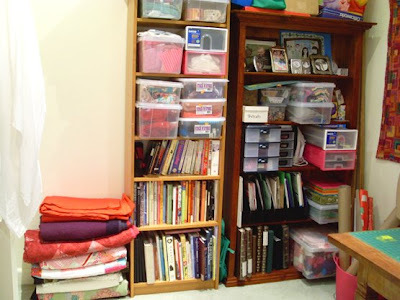 I feel sick when I walk in my sewing room it is soooooo bad at the moment! Enjoy Deb's class! oh goodness, you have just reminded me I need to clean my studio!!! It is such a cesspool right now but I always try to justify it saying that it is good when it is messy as it means I have been productive!!! Thanks for the congrats too!! Interesting project - cant wait to see what it turns into! You have a wonderful workspace! If everything is matchy-matchy, it gets a little bit boring, don't you think? Love to have my own workspace. I just have the dinner table. 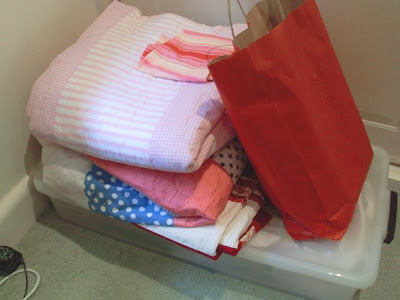 Cann't wait to see your new quilt project, tell me soon what it is. Lovely to meet you over the last two days. I raced over to the sewing machine shop after we finished and picked up the new bobbin case, so Mr Darcy will be ready to go as soon as I want him to. (Yes, the Bernina's name is Mr Darcy. He started off treating Elizabeth dreadfully, but then they ended up having a beautiful relationship...) I'm hoping for the same. 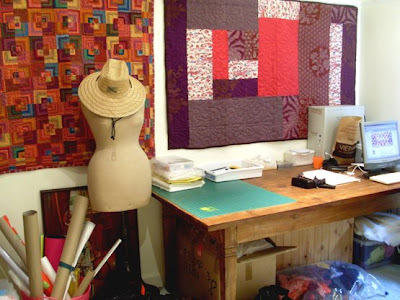 By the way, that quilt on the wall behind your sewing bust lady thing is wonderful!